Temperatures are near normal for January. In other words, a heatwave! Leah Sabatino swapped a Hubway bike Monday for the Uber rides she’d been forced to use to commute to work amid recent brutal weather. It’s a heat wave! Or at least it feels like it. With temperatures soaring to a balmy 35 degrees on Monday and expected to reach 50 later in the week, thawing Bostonians began once again to enjoy the simple things in life — like walking to work without a face mask and checking their phones without their fingertips going numb. After enduring the fourth-longest freezing streak in the city’s recorded history, Boston seemed to bask in the relative normalcy of a typical January day, as temperatures just barely broke the freezing mark for the first time since Dec. 26. 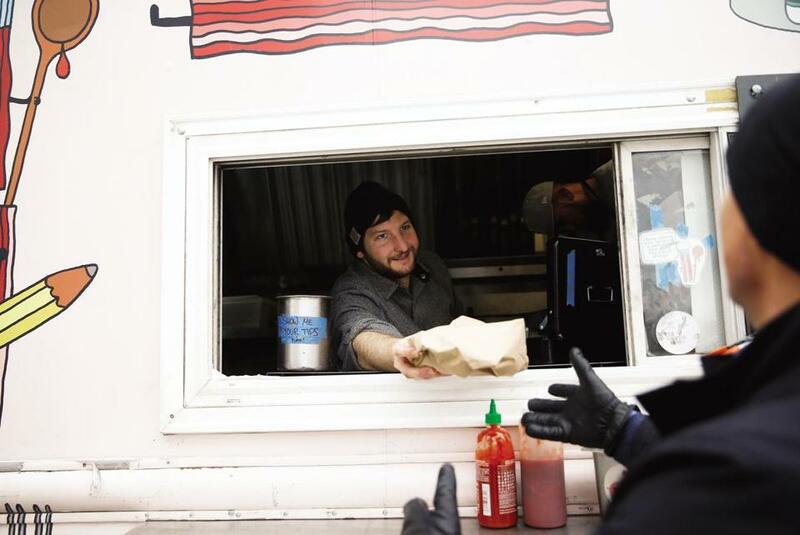 “It’s a nice morale boost being able to feel my toes again,” said Sam Williams, owner of The Bacon Truck, who was back out on the road for the first time in a week, slinging BLTs, grilled cheeses, and Cuban sandwiches on the Greenway, which was littered with snow banks. Warmer temperatures Monday attracted more folks to the streets and to such food haunts as The Bacon Truck. “It’s a nice morale boost being able to feel my toes again,” said Sam Williams, the truck’s owner. If it wasn’t exactly the first day of spring, the brighter mood was still palpable, particularly after residents survived last week’s drubbing from a “bomb cyclone” and a weekend with wind chills that plunged to more than 20 below zero. The modest return to average January temperatures — 36 is typical for this time of year — “absolutely” makes people feel happier because it represents such a dramatic change from last week, said Catherine A. Sanderson, a professor of psychology at Amherst College and a popular lecturer on the subject of happiness. Indeed, many spots around the state were about 15 to 25 degrees warmer on Monday than Sunday, according to the National Weather Service. If it were this cold in October, after a long stretch of weather in the 40s and 50s, people would be complaining, she said. “But 28 degrees after we’ve had single-digit temperatures for a week actually does feel very pleasant to people because we’ve adjusted; we’ve adapted,” she said. And, oh, what a difference it was on Monday, as Bostonians reacclimated to temperatures were downright springlike by recent standards. It felt so warm on Monday to Pat Lyons that the 24-year-old South Boston resident ditched his gloves and earmuffs, along with the sweater he has been wearing underneath his jacket. 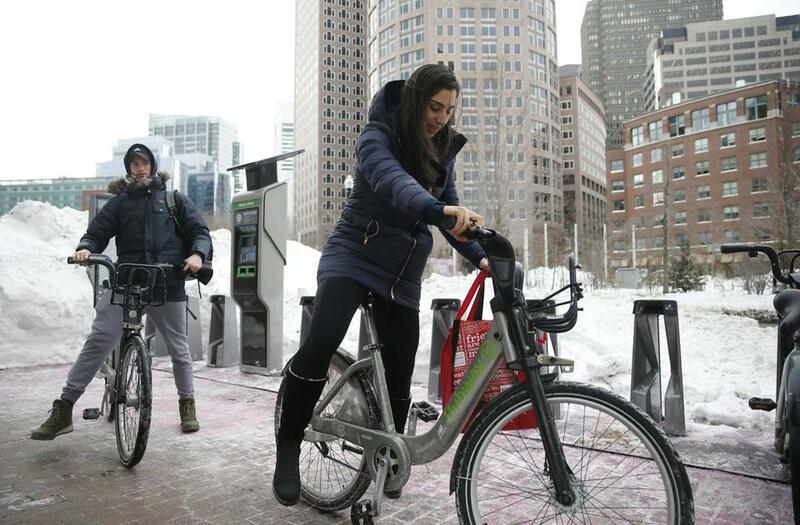 Leah Sabatino, a 23-year-old trainer at Equinox in the Seaport, took a Hubway bike to work on Monday, after a week of trudging through the snow from her home in the North End or taking an Uber to avoid the subzero wind chills. Chris Morris, 24, who works at Three Center Plaza, was standing outside Monday, smoking an e-cigarette and boldly sporting a jacket — slightly unzipped. “It’s balmy compared to last week,” he said. 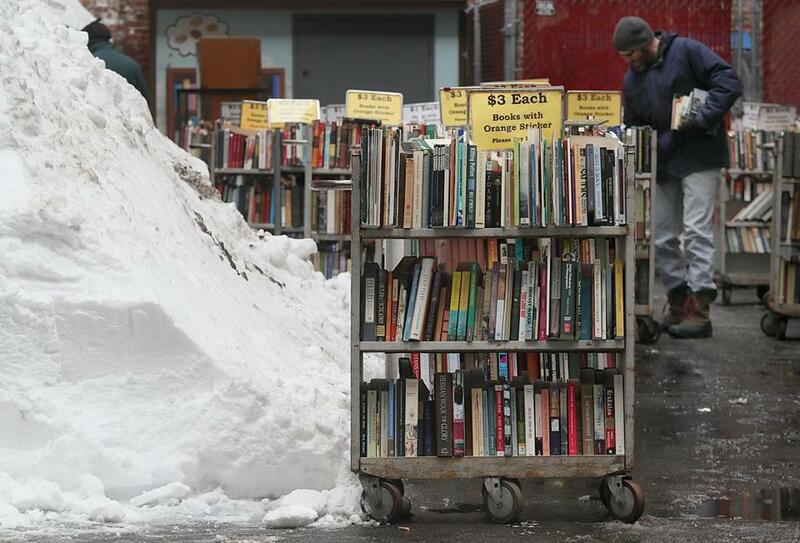 People browsed carts of books for sale on a sidewalk. Ok. We're up to single digits, so time to find the ole flip- flops since it will feel so relatively balmy. Good Morning World! It?s a balmy 22 degrees here in Boston. Feels like a heat wave! Bring on the melting this week! Michael Levenson can be reached at michael.levenson@globe.com. Steve Annear can be reached at steve.annear@globe.com.